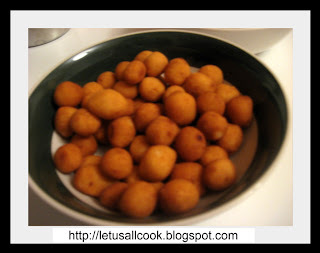 I really didn't know how to call Cheedai in English and ended up calling them as tiny rice flour balls. Cheedai is a south indian recipe made for Krishna Jeyanthi (Birthday of Lord Krishna)/Gokulashtami. It is a very famous snack made from deep frying rice flour balls. Making of cheedai has always made be nostalgic. Every time when my mom prepares cheedai, she will prepare the dough and give it to me and my dad. We both take partnership in making tiny balls out of it. We always end up fighting that the balls are out of shape or it is bigger. My mom never gets satisfied with the shape we make. This snack is very easy to prepare. Though first time makers must be careful, because there are a lot of chances for the balls to pop when deep fried. But I have found out a easy technique to overcome this. Tip: Make a hole with a toothpick on each ball before deep frying. It will help the balls from popping. Prepare the dough mixing all the above ingredients in a bowl. The dough must be semi solid. 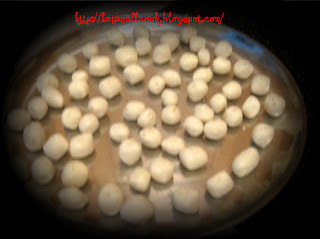 Take small amount of dough and make tiny balls like shown in below picture. As told before, use a tooth pick and make a hole in each ball. Now put these balls and deep fry them till they turn light brown. Allow them to cool. Store it in an air tight container and enjoy! Note: They become crispy only after they are cooled to room temperature so do not hurry! My hubby loves cheedai, and I am a sucker for any savory snacks. These look delicious! have great respect for enone who can make cheedai that are not hard..looks yummy..
seedai is one of my favorite snacks and it looking so good! Yum, I love these. I also posted a recipe for these long back. Looks so delicious Sangeeth! Sounds interesting! Neverheard of this before. Wow simple recipe. GOing to try this out soon. Wow looks awesome.. one of my fav snacks.. This new to me but looks good. Liked it for snack time. Rice balls look awesome and yummy.One of my favorite snacks. I love cheedai, its truly amazing that you made cheedais, I dare not attempt as my mother got burnt once attempting to make cheedai as they jumped out of the oil and landed on her. But I think after reading your toothpick tip maybe I may venture after all.